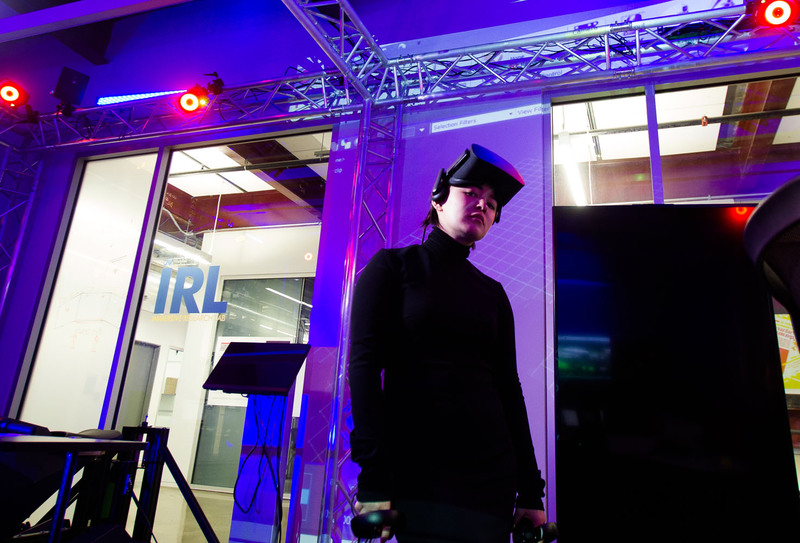 Located in the heart of the Westphal College of Media Arts & Design’s URBN Center, the Immersive Research Lab (or IRL) is a lab space dedicated to the study and research of immersive media including VR, AR, Immersive Projection and other technologies. The lab brings these technologies together in a single, dynamic space specifically designed to encourage collaboration across programs, departments and even different colleges throughout Drexel University. 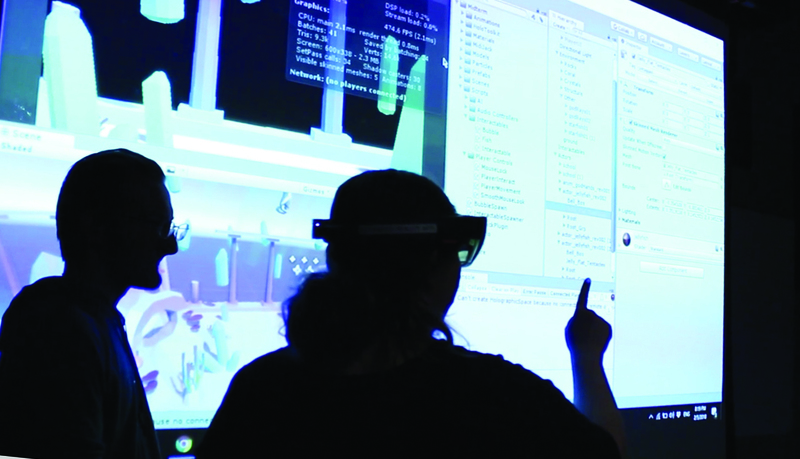 While the department has over a hundred VR ready computer systems distributed throughout other classrooms and labs in the department, the IRL is designed specifically for Immersive Media. The floor space is almost completely open, with trussing supporting multiple motion capture systems and an ambisonic audio system. Of course there is a collection of both Macs and PCs in the lab to enable VR and AR development for almost any consumer platform, but the lab also features specialized HP-ZVR Backpack computer systems that can be worn, untethered, by users as they interact in virtual spaces using VR controllers, or the motion capture systems. The lab can also be networked with Animation, Capture and Effect Lab’s larger motion capture system across the hall to facilitate “larger than room scale” virtual experiences. Reporters from Philadelphia’s NBC10 visiting the IRL to learn about the latest technologies available to Drexel students. Take a look at their full report here on NBC10’s website. Located by the central staircase and elevator of the URBN Center’s open floor plan, the lab is in the center of all the action in the building. 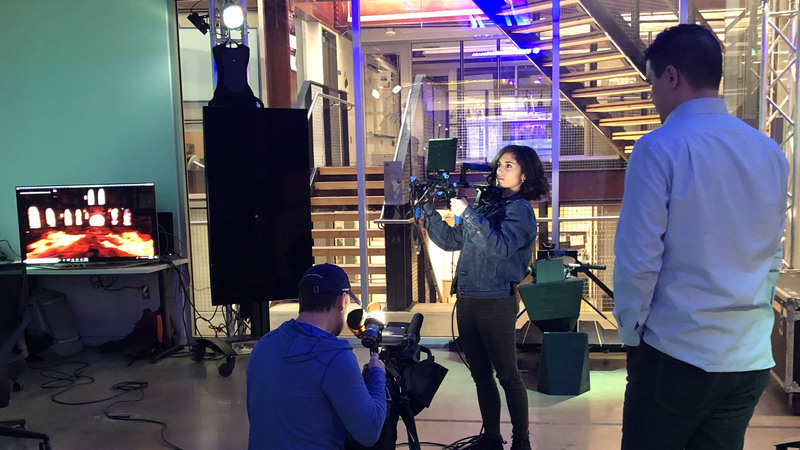 From the lab, you’re just steps away from the laser cutters and 3D printers used to create custom hardware, 3 different screening rooms, the product design and fashion design departments, and just across the hall from the main motion capture and greenscreen studio in the ACE-Lab. Most of the wall space around the lab is glass, which makes the work being done inside readily visible to everyone passing by. As a result of the attention the space gets, there are routinely faculty and students from all corners of the university working together in the lab. Computer Science, Immersive Media, Animation, Game Designers, the Nursing College, Product Designers… really anyone with an interest in Immersive Media eventually finds their way to this lab where the resources to develop and refine almost any kind of immersive media project are in place and ready to be used. 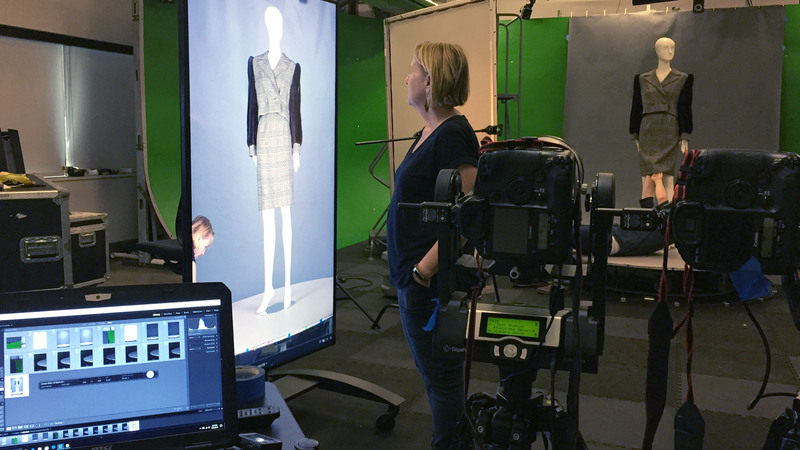 Faculty and students worked in the IRL to create 360° digital gigapixel views of garments by famed designer James Galanos. The team completed a fully interactive touch-based display which was opened to the public as part of the Pearlstein Gallery’s retrospective exhibition of Galanos’ work. 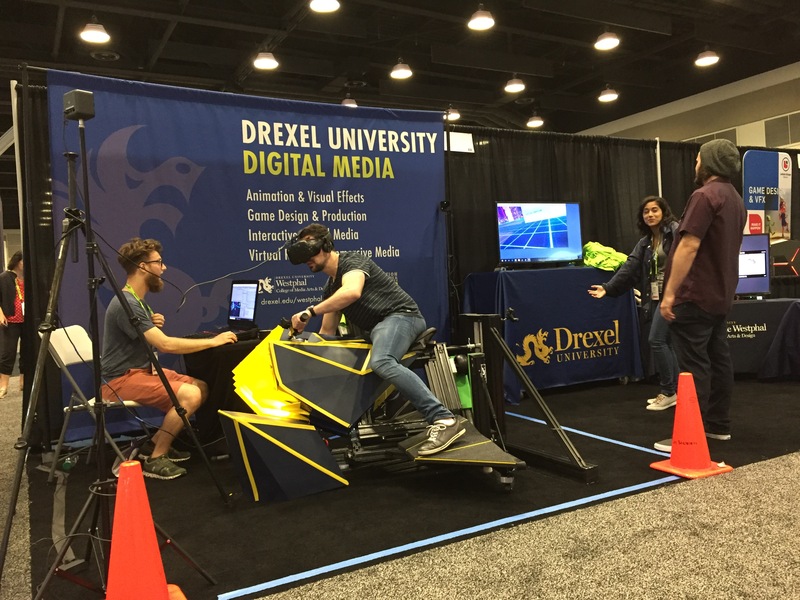 For the 2018 SIGGRAPH Conference, a group of students and faculty built a fully ride-able VR “Motorcycle” ride system where VR trackers were used to follow the real-world rides movements as a rider leaned into turns, and translate those movements into control inputs for several student-developed video games design specifically for the cycle. The project involved students from not just the VR & Immersive Media program, but also Game Design, Animation, Electrical Engineering, Mechanical Engineering, Product Design and Computer Science. In the end, we shipped the ride to Vancouver and exhibited it internationally at the 2018 SIGGRAPH Conference. An immersive paleoart piece, Dreadnoughtus VR was the master’s thesis project of graduate student Valentina Feldman. She worked in collaboration with graduate students working in Paleontology at Drexel’s College of Arts & Sciences, and the staff at Drexel’s Academy of Natural Sciences. 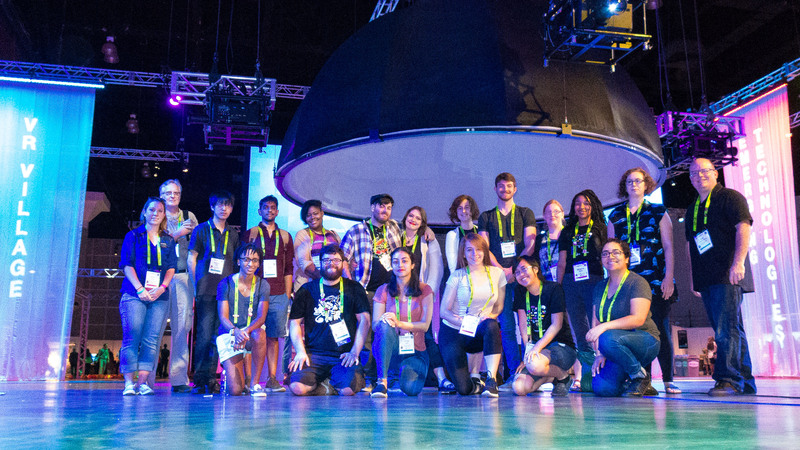 A group of students and faculty from Drexel collaborated to create the immersive projection space that served as the entrance gateway for the 2017 SIGGRAPH Conference Experience Hall. The space featured four 9ft x 12ft projection screen walls, and an 18ft diameter projection dome, all filled with immersive animation created by the students, as well as theatrical lighting and conference signage.